Solarization is the practice of using clear plastic mulches to trap solar energy, heating soils to temperatures lethal to pests including weeds. Solarization is nothing new; it has been researched and used by growers extensively since the 1970s in warm, sunny places like Israel and California, but the conventional wisdom has been that it is not consistently effective in cool, northern places like Maine. 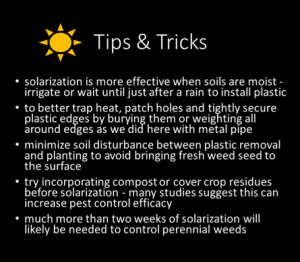 We expected that two weeks of solarization during May-June in Maine would not achieve temperatures hot enough to kill weeds, but would rather lead to an early flush of increased weed emergence. After solarization, we thought these weeds could be killed by flaming, resulting in creation of a better stale seedbed than a “control” created with flaming only. Hypothesis: two weeks of spring solarization will encourage weed seeds to germinate so they can be killed, depleting the seedbank and creating a better stale seedbed. We tested this hypothesis through four experiments in May-June of 2015 and 2016. At the start of each experiment, fields were rototilled, thoroughly irrigated, and solarization plots were covered with salvaged 6-mil clear polyethylene hoophouse plastic. We secured the plastic edges by clipping them to metal pipe laid in a shallow (4” deep) trench around each plot. Control plots were left fallow after rototilling and irrigating. 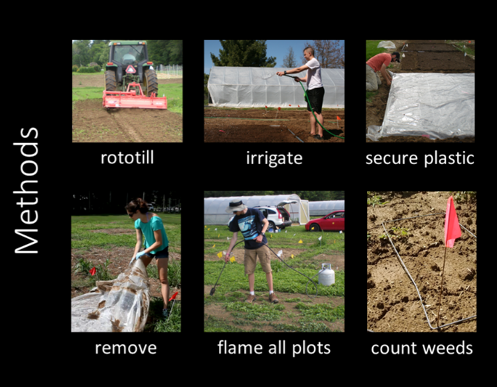 After two weeks, plastic was removed, and all plots (solarized and control) were flamed using a hand-held propane burner to create stale seedbeds. Two weeks after flaming, we counted the number of weeds that had emerged in each plot. To our surprise, two weeks of springtime solarization actually suppressed weed emergence, both while plastic was in place and after plastic removal and flaming. On average, solarization plus flaming resulted in stale seedbeds with 78% fewer weeds than control stale seedbeds created with flaming only. Soil temperatures were higher in solarized plots, reaching a maximum of 117°F at 2” soil depth, as compared to a maximum of 100°F in controls. 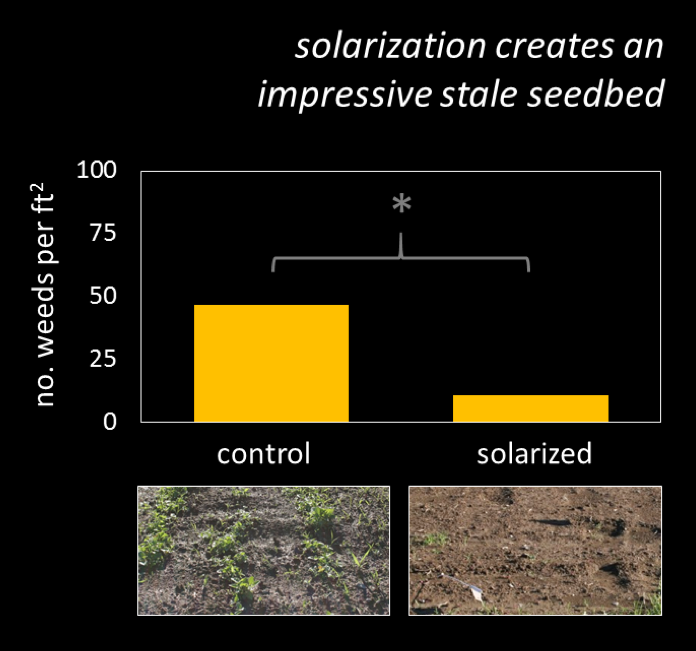 Results: two weeks after we removed plastic and created stale seedbeds, there were 78% fewer weeds in the solarized treatment than the flamed control. The “*” indicates a statistically significant difference between solarized and control treatments. The weed suppression following solarization was so visually apparent, we wondered whether flaming after plastic removal was necessary. To address this question, during one of our experiments we kept half of each plot un-flamed for comparison. 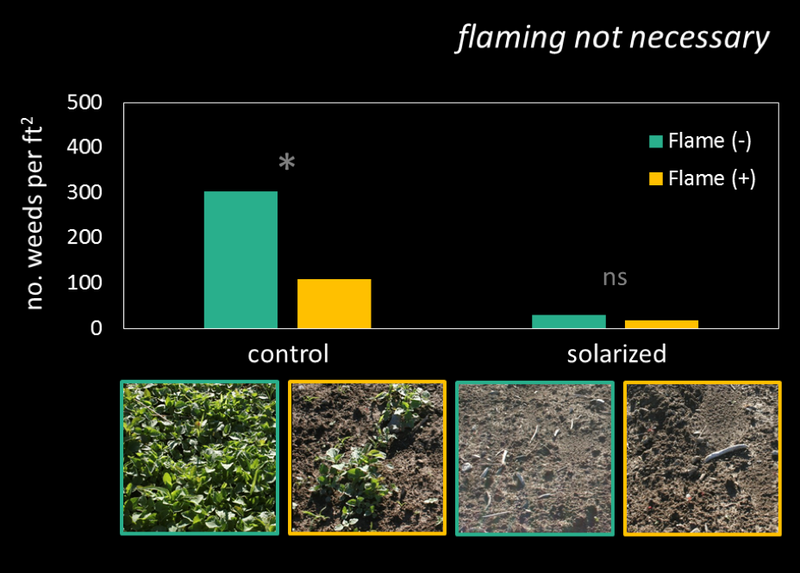 We found that flaming significantly reduced weeds in the control plots, but not the solarized plots. In short, solarization did a good enough job that flaming afterward was not necessary. Solarization with or without flaming created an excellent stale seedbed. The “*” indicates that flaming significantly reduced weeds in the control treatment, the “ns” indicates that flaming did not have a significant effect in the solarized treatment. Overall these results suggest solarization is a very promising strategy for stale seedbed preparation in Maine. Although laying the plastic is labor-intensive, the weed control benefits may be worth the extra effort, especially prior to planting high value direct seeded crops. 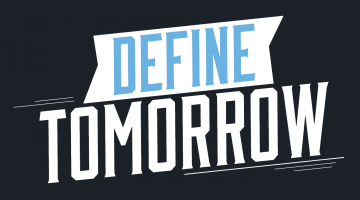 More blog posts about solarization coming soon!